The Federal Reserve prefers to keep the fed funds rate between 2 and 5 percent. It's the sweet spot that maintains a healthy economy. That's where the nation's gross domestic product grows between 2 percent and 3 percent annually. It has a natural unemployment rate between 4.5 percent and 5 percent. Price increases remain below the Fed's inflation target of a 2 percent core inflation rate. The fed funds rate was 2.5 percent as of March 21, 2019. But there were times in history where the nation's benchmark interest rate was well above its sweet spot. That was to curb runaway inflation. Between 2008 and 2015, it was well below the target to stimulate economic growth. Once you see how the Fed changed the fed funds rate, you will understand how it managed inflation and recession. The fed funds rate reached a high of 20 percent in 1979 and 1980. That was to combat double-digit inflation. That bout of inflation began in 1973 after President Nixon weakened the dollar by disengaging it from the gold standard. Inflation tripled from 3.9 percent to 9.6 percent. The Fed doubled interest rates from 5.75 to a high of 11 points. Inflation continued to remain in the double-digits through all of 1974. It lasted until April 1975. The Fed kept raising the fed funds rate to a peak of 13 in July 1974, and then dramatically lowered the rate, reaching 7.5 by January 1975. These sudden changes, known as stop-go monetary policy, confused businesses. They kept prices high to stay ahead of the Fed's interest rate spikes. That only made inflation worse. Fed leaders learned that managing inflation expectations was a critical factor in controlling inflation itself. In 1979, Federal Reserve chair Paul Volcker ended the Fed's stop-go policy. He raised rates and kept them there to finally end inflation. That created the 1980 recession, but double-digit inflation hasn't been a threat since. The all-time low was 0.25 percent. That's effectively zero. The Fed lowered it to this level on December 17, 2008, the 10th rate cut in a little over a year. It didn't raise rates until December 2015. Before this, the lowest fed funds rate was 1 percent in 2003 to combat the 2001 recession. At the time, there were fears that the economy was drifting toward deflation. The chart below shows the targeted fed funds rate changes since 1971. 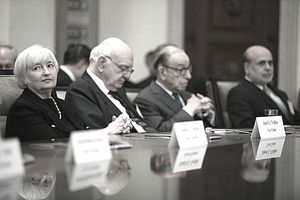 Until October 1979, the Federal Open Market Committee didn't announce its target interest rate after meetings. The target rate was inferred by an archived chart published by the Federal Reserve Bank of New York. The bank adjusted the rate through open market operations. As a result, the rates changed gradually, even in between meetings. Businesses were forced to guess what the rates would be. The Fed tried to fight inflation without managing the expectations of inflation. In 1979, the Fed began targeting the money supply to fight inflation. As a result, the fed funds rate fluctuated a great deal between 1979 and 1982. In 1982, the Fed returned to targeting the fed funds rate specifically. In February 1994, the FOMC formally announced its policy changes for the first time. Since then, its announcements make it clear what it wants the interest rate to be. The Federal Reserve Bank of St. Louis publishes a complete history of the effective fed funds rate since 1954. The Fed also has transcripts of all meetings since 1936. 5.0% Inflation at 4.4% year-over-year. 5.5% Nixon shock. Weakened gold standard. Tariffs. 5.25% Fed lowered rate to boost growth. 5.5% Nixon devalued dollar, creating inflation. 5.75% Fed raised rate to combat 3.5% YOY inflation. 6.0% Fed raised rates to combat 3.6% inflation. 7.5% - 7.75% Inflation at 5.5%. 11.0% OPEC embargo worsened inflation in October. 9.0% Recession had begun in November 1973. 10.0% Embargo ended in March. 13.0% Inflation at 11.5%. Ford replaced Nixon in August. 9.25% Fed lowered rates to end recession despite 12% YOY inflation. 6.5% Inflation falls to 7.9%. 4.75% Rate lowered from October through January. 5.5% Raised in April and May. 5.0% Official end of gold standard. 4.75% Lowered from July - November. 6.0% Inflation rises to 7% in April. 6.5% Raised again in September and October. 6.75% Inflation rises to 6.8%. 8.0% Inflation rises to 7.9%. 10.0% Raised each month from April through December. 11.5% Inflation rises to 11.9%. 13.0% The Fed began targeting the money supply. 15.5% Conference call raised rates 2.5 points. 15.0% Recession began in January. Inflation at 14.6%. 11.5 Conference calls on April 29 and May 6 lowered rates. 8.5% Recession ends in July. 10.0% Raised rates back up. Inflation at 12.9%. 18.0% Inflation eases to 12.6%. 20.0% Reagan took office. Volcker raised rates again. 16.0% Conference call lowered rates. 20.0% Recession began in July. 13.0% Gradually lowered rates over 6 months. 15.0% Gradually raised rates 3 points over 4 months. 13.0% Conference call. Gradually lowered rates. 9.5% Gradually raised rates over 5 months. 9.66% Raised from May to August. 11.75% Raised from March to August. 8.25% Lowered from September to December. 9.0% Raised from February to mid-March. 6.75% Continued raising rates to fight inflation. 6.75% Lowered after Black Monday stock market crash. 8.25% S&L crisis. Fed lowered rates. 8.0% Recession began in July. .
7.0% Economy contracted 3.6% in Q4. 4.75% Fed continued lowering rates to fight unemployment. 1993: GDP = 2.8%, Unemployment = 5.5%, Inflation = 2.7%. Clinton took office in 1993. Fed made no changes. 3.25% Fed raised rates to keep economy healthy. 5.25% Kept rates low despite inflation. 5.0% Recession began. Fed lowered rates to fight it. 3.75% EGTTRA tax rebate enacted. 1.00% JGTRRA tax cuts enacted. 1.25% Low rates pushed interest-only loans. .
2.5% Borrowers could not afford mortgages when rates reset in 3rd year. 4.5% Raised to cool housing market bubble. More homeowners default. 4.25% LIBOR rose. Recession began. 2.0% Lehman fails. Bank bailout approved. AIG bailout. The Fed kept the rate at zero between 2008 and 2015. Recession ended in June 2009. 1.75% Fed projects steady growth.